We have finally done it! After being inspired by my friend Teri’s guest post in February, my daughter and I have finally made our own Waldorf doll from a Magic Cabin Doll Kit. The Magic Cabin Doll Kit comes complete with mohair yarn for hair, wool for stuffing the body, embroidery floss for eyes and mouth, and skin stretch fabric. In addition, you will need matching thread for the skin tone and hair, as well as a long dollmaking needle, a sewing machine, and fabric for clothing. Making your own doll takes between 6 to 12 hours, depending on your skills and your child’s involvement. Our doll took about 7 hours to make, including the dress. My six-year old daughter’s participation was limited to stuffing the wool into the body and winding the hair around a book, but she was attentive and watched me sew (and bounced around in excitement) during the whole process. Going to the fabric store to pick out the dress was also a fun experience for us. The directions included in the Magic Cabin Doll Kit are very clear. I was never confused, although I do have lots of quilting and sewing experience, I have never made a doll. The most difficult part was feeding the elastic through the casing on the dress collar, but other than that, I was surprised at how smoothly the process was for our doll. The Magic Cabin Doll Kit does come with patterns to make five different articles of clothing. Waldorf dolls typically are very simple, allowing your child’s imagination to fill in the details. The natural materials and soft wool stuffing, make this doll far superior to plastic ones. My daughter really appreciates this doll, and it has become her favorite one, replacing other Waldorf dolls we have purchased. 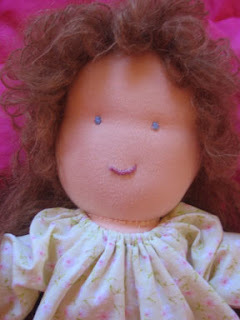 She is old enough to appreciate the doll is handmade with love, and she showered me with compliments when I was sewing. She was amazed her mommy could create such a lovable toy, thanks to theMagic Cabin Doll Kit. I have had my eye on these kits for some time now although I have been leery. 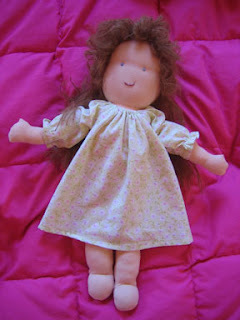 I have never made a doll before although I too have done lots of sewing. I’m glad to hear that they aren’t too difficult. I did buy one of Magic Cabin’s Little Blossom Doll Kit’s when they were still available but it’s still sitting on a shelf in my bedroom. LOL Perhaps I’ll get it finished in time for Christmas. this sounds like a very sweet project for parent and child!